Incredible edibles is the newest social enterprise in the GCLA family. Social enterprises are revenue-generating businesses with a twist – to achieve social, cultural, community economic and/or environmental outcomes. In all our social enterprises we offer employment at a full wage to people who, for whatever the reason, may not have had that opportunity before. 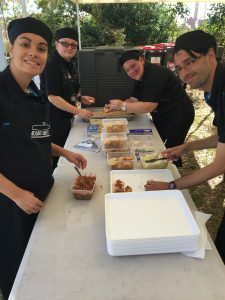 From catering for small functions providing morning tea, lunch and afternoon tea’s, all the way through to large corporate events, Incredible Edibles are the team for you. Please feel free to give them a call on 0407 411 885 or email incredibleedibles@gcla.com.au they will be only to happy to cater for your needs! Copyright © 2016 Gladstone Community Linking Agency. All rights reserved.